Hollywood superstar Bruce Willis (ARMAGEDDON, THE SIEGE) brings a powerful presence to an edge-of-your-seat thriller from writer-director M. Night Shyamalan (Oscar(R)-nominee for Best Original Screenplay and Best Director) that critics are calling one of the greatest ghost stories ever filmed. When Dr. Malcolm Crowe (Willis), a distinguished child psychologist, meets Cole Sear (Oscar(R)-nominee Haley Joel Osment, Best Supporting Actor), a frightened, confused, eight-year-old, Dr. Crowe is completely unprepared to face the truth of what haunts Cole. With a riveting intensity you'll find thoroughly chilling, the discovery of Cole's incredible sixth sense leads them to mysterious places with unforgettable consequences! "I see dead people," whispers little Cole Sear (Haley Joel Osment), scared to affirm what is to him now a daily occurrence. This peaked 9-year old, already hypersensitive to begin with, is now being haunted by seemingly malevolent spirits. 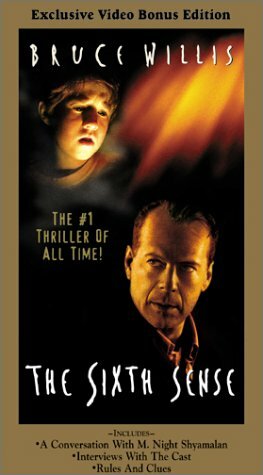 Child psychologist Malcolm Crowe (Bruce Willis) is trying to find out what's triggering Cole's visions, but what appears to be a psychological manifestation turns out to be frighteningly real. It might be enough to scare off a lesser man, but for Malcolm it's personal--several months before, he was accosted and shot by an unhinged patient, who then turned the gun on himself. Since then, Malcolm has been in turmoil--he and his wife (Olivia Williams) are barely speaking, and his life has taken an aimless turn. Having failed his loved ones and himself, he's not about to give up on Cole. The Sixth Sense is a wonderful movie. M. Night Shyamalan was only known (just barely) for one movie up until this point, Wide Awake, so this was definitely unexpected. The movie features Bruce Willis as a child psychologist who sees a patient (Haley Joel Osment) that can speak to dead people. The movie wnet on to score five Academy Award nominations and a place on AFI'a 10th Anniverary list. This version of the DVD, the single disc version, features a number of featurettes and deleted scenes, definitely worth a look. The Sixth Sense hit all of the right notes right on the button and worked really well. I was drawn in and was taken by surprise by the ending, only to realize soon afterwards that, of course, it had to be that way. The story of a boy who communicates with dead people's spirits and who consults with a psychologist, is perfectly directed by M. Night Shyamalan. The excellent screenplay was also written by Mr. Shyamalan, who demonstrates being able to translate a vivid imagination onto the screen. Bruce Willis, Haley Joel Osment and Toni Collette head the talented cast. Each of these three actors acts wonderfully in this movie. M. Night Shyamalan made a household name for himself no matter how difficult the pronunciation with this `Grade-A' supernatural thriller about a young boy troubled by his unique gift. The film opens with a tragic event involving Malcolm Crowe, a child psychologist who has just received an award in his honor. But before the celebrations can truly begin he's confronted by an ex-patient of his who it seems Crowe was never able to help. The aftershocks of that evening ring throughout the remainder of the film as Crowe's relationship with his wife becomes more and more strained. But as that relationship slowly dies he forms a bond with his new patient Cole Sear. Cole has a problem that is presents itself almost too familiar with Crowe. It appears that Cole can communicate with the dead. Both Bruce Willis and Haley Joel Osment are outstanding in this brilliant film. Some have claimed Willis to be too reserved and reclusive and thus leaving the entire film on the shoulders of the very capable Osment, but in my eyes both of these actors contribute exactly what they needed in order to make this film work. Willis wears the confusion of his situation on his face with earnest honesty and that adds layers to his character. Osment shines so brightly here and should have walked away with the Oscar that night, but alas, he'll have his day again I'm sure. He gives Cole so much charm and charisma. He's able to create a believable nine-year-old boy without playing the complexity of his character down at all. He adds so much believable maturity. It's truly astounding to watch. The star of this film though is Shyamalan who instills a deep-rooted fear into the audience from the very beginning. It's this very asset that sets `The Sixth Sense' apart from all the Hollywood cheap imitations that seemed to swarm the theaters shortly after `The Sixth Sense' made a killing and set the bar. Sure, there are a few that followed that were worth the price of admission (the Nicole Kidman vehicle `The Others' was one of them), but for the most part nothing since has even touched the surface of the effortless brilliance that was and is `The Sixth Sense'. The lighting, the music, the atmosphere, set designs, script and acting all add so much originality and suspense to this one of a kind experience. I enjoyed both Bruce Willis and Haley Joel Osment as the two leads. Willis has had many action-packed, profane macho roles in his career but I like him best when he's low key, as he is in here (and in "Unbreakable," to name another fairly-recent movie) Osment, meanwhile, is a terrific child actor, as he has proved in other films. He's simply one of the best of his young generation. He and Dakota Fanning are the two best child actors I've seen in many years. Way to stiff the actors, amazon! This film is worth all its five stars and more, but what's up with amazon.com listing the actors as Firdous Bamji, Mischa Barton, Toni Collette, and Janis Dardanis? Collette is certainly worth mentioning -- her performance is terrific -- but who the heck are Bamji and Dardanis? Mischa Barton's fifteen minutes of fame in The O.C. hardly merits billing over Bruce Willis and Haley Joel Osment, who give two of the most affecting and intelligent screen performances in recent memory. It was always a complete mystery to me what people saw in this movie. Why it caught on in terms of popularity across the United States back in the late 90's is totally beyond me. When I first watched this movie, the first thing that went through my mind was "Oh no, this movie is going to kill the horror genre". Luckily not every single horror movie ripped off the ideas of this film to make the entire genre worthless (unlike say, Van Halen, whose influence made listening to guitar solos in a rock song a chore from that point on, but that's a different subject for a different time). I was never *ever* scared while watching the Sixth Sense. Not even once. Nothing even came close to giving me goosebumps. Everything came across so ordinary, almost like a dream from a childs point of view. No, not a nightmare- just a regular dream. I was completely unsatisfied with the acting as well. The little boy from Thunder Alley was the worst possible choice- he wasn't convincing at all. I didn't feel his emotions (which were overbearingly exaggerated most of the time). The whole "I see dead people" thing was about the dumbest thing I've ever seen. Watching him walk around and say things like "There's a dead guy over there" didn't have me convinced a dead spirit was around him at all. Guess what everyone? There's a dead guy standing next to me while I type this review for amazon. I'm scared, shaking and very nervous right now. Are you scared? Of course not. Going to high school when this movie came out, I can't believe so many of my classmates were scared of this story and actually went around saying the new hot expression "I see dead people". How horrible. Then again, maybe they were making fun of it. I hope so. Like your movies eerie? How about a movie that has great acting ( particularly by Bruce Willis, Haley Joel Osment, and Toni Collette ), and exceptionally, creepy atmospheric cinematography by the great Tak Fujimoto? Did I mention that it happens to be one of the best ghost stories ever? If you are one of the few people in the 'civilized' world that has not seen Shyamalan's masterpiece, there is no time like the present. It's been eleven years since a new director with the unlikely name M. Night Shyamalan graced theatergoers with this icy ruby of movie magic. And although he has made worthy follow-ups in the years since, for me, he's never topped THE SIXTH SENSE. Malcolm Crowe is a child psychologist tormented by the one patient he couldn't save. It's been a year since he had to confront that awful truth, and in that time, his confidence and his marraige have undergone a slow and steady crumble that has finally reached the breaking point. Enter Cole Sear, an eight year old child of a single mother with a decidedly nasty neurosis: he believes he sees the dead. If Crowe (Bruce Willis) can help the boy (Oscar-nominee Haley Joel Osment), he may just redeem himself; but the effort he spends in doing so continues to erode his relationship with his wife, and a nagging suspicion that Cole is NOT delusional threatens Crowe's fundamental understanding of the universe. This is a terrific thriller-ghost-story-drama that would suffer from any further explanation. Great acting and subtle direction (note the selective usage of the color red), along with an absolutely killer storyline, make THE SIXTH SENSE probably the best movie of 1996. Eleven years later, it still holds up. "I see a dead format"
"I see dead people". You've heard that line before. This is the movie that started the jokes and spawned other movies based solely on that one line. When a movie has that kind of power, you know it's good. So what's this movie about? Basically, a pyschologist (Malcolm) comes to a little boy's (Cole) aid when he claims that he can see dead people. No one else can see these dead people and they're not friendly by any means. Malcolm has to try and come up with a way to make living with dead people more tolerable for Cole (if that's at all possible). Meanwhile, Malcolm has to deal with his own personal issues when his wife stops talking to him after he got shot by a former patient a year before.